Saturday New Year’s Eve Dec 31 2016 23:59:60 and lasts one second until Jan 1 2017 00:00:00 (UTC). During the leap second all the works in the festival are exhibited, executed, performed. This year we’ve emphasized collaborative, experimental, project-based works that in various ways embed the leap second idea and function as leap second events in themselves. The festival is a distributed, decentralized event coordinated on the net. There are around 140 participants in the festival, including the residency program. &(Barbora Trnková & Tomáš Javurek), Agam Andreas, anonymous74, Dan Arenzon, William Bain, Domenico Dom Barra, Dennis De Bel, Diego Bernaschina, Sissel Berntsen, Browserbased group, Igor and Ivan Buharov, Christian Bøen, jonCates, Anna Chatziioannidi, Nick Collins, Martin Conrads, det0une (Edoardo Gaudieri), Dim Dx [Dmitry], Eros Dibra, g_host, Cleber Gazana, Emilie Gervais, Kyriaki Goni, GrandLapin, Gottfried Haider, Samantha Harvey, Erik Hesby, Isaac Andrés Espinoza Hidrobo, Tibor Horváth, iEstupor, INTERLICHTSPIELHAUS, Jan-M. Iversen, iwbdjdyatmvezdmnekzawvb, Timo Kahlen, Martin Kleppe, Jan Robert Leegte, Dimitris Leontzakos, Patrick Lichty, Robert B. Lisek, Anita Lugomer, Riccardo Mantelli and Sara Savini, Sherwin Altarez Mapanoo, Konstantina Mavridou, Microfost, Ortensio Lando, Lorna Mills , Laura Netzzz, Maia Nichols, Anne Niemetz, Pancrazio Leonardo de Padova, Simon Perathoner, Klaus Pinter, Dominik Podsiadly, PolakVan Bekkum, Miriam Poletti, Frère Reinert, Michael Ridge, Stefan Riebel, Nigel Roberts, Bence Rohánszky, Natallia Sakalova, Giovanni Salice, Vijay Kumar Sappatti, Alan Sondheim, Shivkumar K V, Filippo Tassinari, Sacha Toncovic, Andrew Topel, Juergen Trautwein, Jules Varnedoe, Matt Vogel, Thomas Wernberg, Joonas Westerlund, Alexis Williams, William Wolfgang Wunderbar, Pawel Wocial & Kamila Tuszynska. Artists: Jordan Topiel Paul, Douglas Repetto, Joseph Moore, Maja kalogera, Nina Sobell, Micheál O’Connell, Bartis Noémi, Krishan Mistry, h/ lev, Jak Bobby, Denise kehoe, Erica Mena, Dirk Vekemans, Nhawfal Juma’at, ronnie s, Heike Endemann, Bron Belcher, didem erk, Jessica Earle, judithS bauer, Faith Wilson, Victor Matthew Ablorh, Daniel Giordano, marcela jardon, Filippo Tassinari, Rodrigo Arenas-Carter, Mattias Hellberg, Tamsin I Irwin, Wei Hsinyen, Okwei Odili, Nathan Markham, Alex Ness, Jedrzej Cichosz, Patrick Lichty, maia nichols, Igor and Ivan Buharov, Sara P, Eylul Dogruel, hizzy, The Best (Najbolja), Ramon Bonilla. Art, new technology and precarity raise some issues which the leap second can exemplify and realize. The leap second adjustment is a consequence of technology, practically immaterial, virtual, untimely – outside of time so to say – awkward, unsuitable and is a glitch or a wobble on global scale in earth’s rotation and in electronic time systems (OSs). In the same way, the festival is scalable from extremely big to extremely small, somehow mirroring the extension of technology. It’s also a metaphor for the precarity caused by technology. And it’s questioning its own existence: A leap second is an extra second between :59 and :00 that is left invisible on our watches and most computer systems. It’s usually faked using one of three glitchy processes – repeat, freeze, smear – to adjust clock-time. And finally. with its awkward, impossible format, the focus of the festival could very well be exactly that: a questioning of art and its appearance, materiality, objecthood, to tie onto traditions of conceptual and postconceptual art, net art, ao. and lead to an exploration of media in search of itself (as an ‘appearing’ form, or questioning its form). A festival or non-event like this could bring these questions to the front as its main character or theme. Description: Works dealing with networks, code, interactivity and real-time processes related to the leap second. Highly recommended! Description: A show with one second moving images works. Description: A soundtrack album for the leap second. 29 Songs and audio-works made, adapted, or remixed to fit the leap second event in various ways – repeat, freeze, smear! Description: A dating service between artists and art residencies that lasts one second. 19 institutions have provided residencies to 41 artists for the leap second! 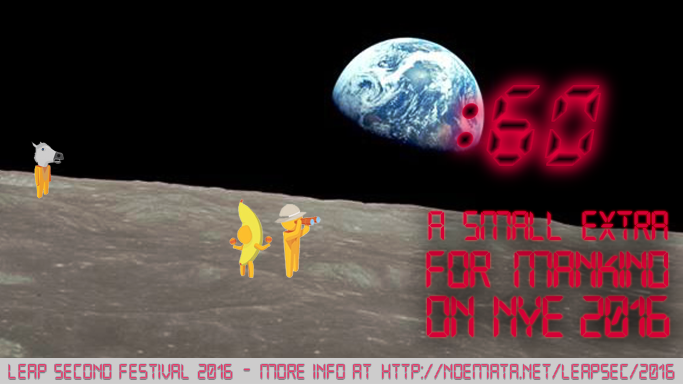 The radio will have a dedicated broadcast of the album “Songs for the Leap Second” during the festival. Schedule: Dec 31 2016 23:59:60 to Jan 1 2017 00:56:00 (UTC – Universal Coordinated Time), which equals: Jan 1 2017 00:59:60 to 01:56:00 (CET – Central European Time). Happy leap second! And (after that) new year! The same thanks also goes to Ana Buigues for discussions, encouragement, and El-Estudio gallery space, Tom Klev for advice, and Arts Council Norway/Visual Arts for funds.